* FULL RV VIDEO TOUR AVAILABLE! - See and learn even more about Jayco RVs and their Eagle series travel trailers by taking a few minutes to watch our full walk-thru RV video tour. 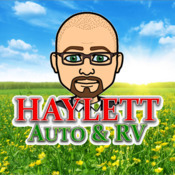 We include in-depth construction information and demonstrate several must-see features of this model so you may have the best information possible regarding your pending RV purchase! Call our RV Sales department at 800-256-5196 for additional information about trade-ins, financing, hitches, accessories, and more! * DOUBLE LENGTH WARRANTY - Like all Jayco RVs this Eagle HT fifth wheel RV includes twice the warranty duration of virtually everything else in this class (with very few exceptions). Jaycos guarantees last longer because Jayco RVs are built to last longer! * 16" TIRES UPGRADE offering a more reliable towing experience! * 50AMP SERVICE UPGRADE makes this RV 2ND A/C READY! Bedroom A/C Installs are available through Haylett RV Parts & Service Center - Simply call for a quote! * ELECTRIC FIREPLACE ADDED for both fun LED visuals as well as extra heat that doesn't consume your propane! * POWER REAR STABILIZERS UPGRADE means setting up and breaking camp is push button simple! * ORBITAL PINBOX UPGRADE gives you the benefits of Mor/Ryde's Shock Dampening Pinbox with the short bed friendly nature of a pivoting revolution pinbox in one! * SANICON POWER DUMP STATION UPGRADE cuts the time required to empty your tanks in half! * FRAMELESS WINDOWS UPGRADE - For an unbeatable look and windows you can still use in light rain conditions we've outfitted this Eagle HT fifth wheel by Jayco RV with frameless windows! * Exterior Travel Length (Pin box to bumper)	30' 1"
* Total Exterior Length	30' 11"
* Exterior Height with A/C	142 3/4"
* Interior Height (Bedroom)	75"
* Wheel Base	231 1/8"